To make the bow take two identical lengths of sugar florist paste. Fold one of the lengths over itself in the middle. This will be the loose ends of the bow. Place the folded part of this length in the middle of the cake. Take the other length and fold both ends to the middle and pinch together. 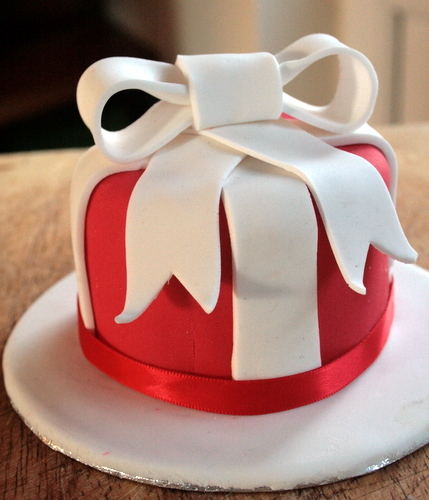 Get a smaller length of sugar florist paste and wrap around the middle of the bow to give the illusion of a knot. This is the bow loops. Stick this on top of loose part of the bow. The green from this cakes comes from the green marzipan layer. This time don’t brush the marzipan with water when adding the sugarpaste as you’ll struggle to get the cutouts cleanly away from the marzipan. Cover the cake with sugar paste then using a holly cutter cut out the holly shapes. Using some water stick the remaining icing to the marzipan. Roll balls of red icing and stick in place with vodka. This cake started out slightly different, hence the snowballs trimming the bottom of the cake, then I saw these beautiful Victorian inspired Ice Crystal Cakes cakes on Peggy Porchen and decided I had to give these a go. 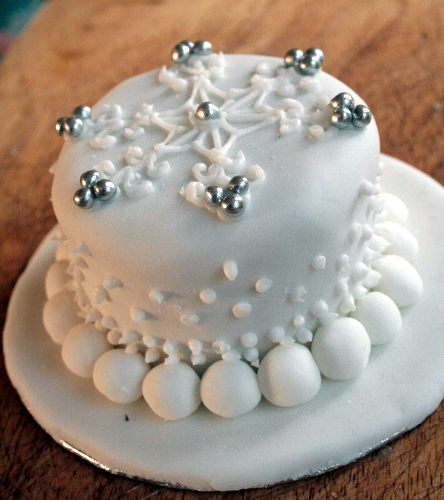 It is piped on using royal icing and the silver balls are great new ones from Dr Oetker that don’t break your teeth. If I was to do these cakes again I would keep the decorative snowflake, leave out the decoration on the side, then just trim the bottom of the cake with simple ribbon. Possibly the easiest of the cakes. Simply covered in white sugarpaste. 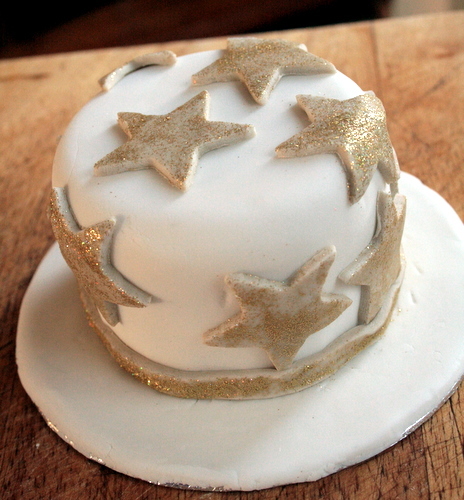 Then I kneaded some gold lustre dust into a small amount of sugarpaste then once rolled out, dusted in edible glitter. Cut out the stars then stuck on with vodka. Edible glitter is always difficult to photograph. In real life this cake is very glittery! This is a very good cake to do if your icing has flaws. Stick a star over the cracks. No icing required here. Melt 15g butter with 15g golden syrup. Mix in 50g mixed fruit & nuts (Lidl do a particuarly fantastic bag of fruit & nuts that I’ve used here). Spoon topping onto cake then leave to set. Trim with ribbon. 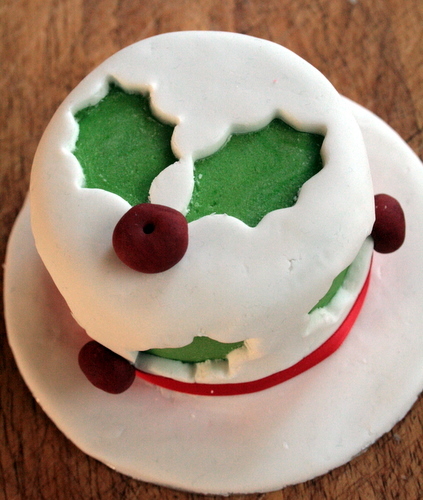 Christmas isn’t Christmas without a Christmas cake topped with break-your-teeth royal icing. I use Royal Icing Sugar as it is easier and more convenient. For a 3 inch cake like these you need about 100g royal icing sugar and 15ml of water. Using an electric whisk whip until you have soft peaks. If it doesn’t reach soft peak stage, add more icing sugar a tbsp at a time. When spreading the icing on you can either make it smooth or go old school and make peaks in the icing to make it look like snow. To make the icing harder add a dash of lemon juice, to make it softer add a bit of glycerine. The robin comes from one of the cakes I made on Holly Bell’s cupcake course. Can you spot the foot prints in the snow? There were made with the end of a skewer. 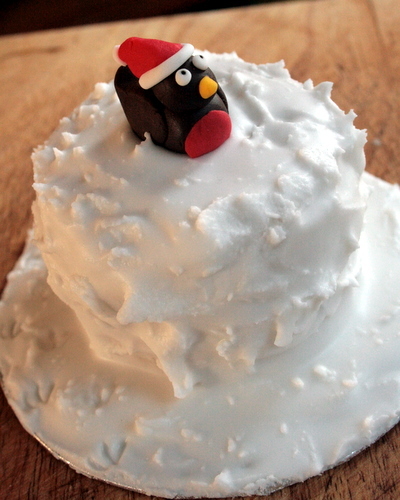 So how have you decorated your Christmas cake this year? Posted on December 8, 2011, in Cake, Christmas and tagged cake decorating, Christmas. Bookmark the permalink. 17 Comments. The snowflake cake is my favourite and has given me lots of ideas for my full-sized Christmas cake. Loved this series and will make minis next year. How long before Christmas can you ice your cake? Sally, you can ice them weeks in advance. The icing essentially seals in the cake. Mine will be stored in cardboard cake boxes (like what you get in bakeries) until I’m ready to give them as gifts. They could also be stored in tins. How beautiful ! I didn’t make a Christmas Cake this year, but will for sure next year. You have been an inspiration for me. They look so professional, and I would so hate to cut into them. Good show. WONDERFUL selection of cakes, I DO love decorating cakes and these are all amazing! These look great – I love how they’re all totally different but all look straightforward to do. Thanks Jules. I’ll get onto mine this week. Thank you Susan. I used to have a similar fear about Fondant. I day course may be beneficial, even if it is decorating cupcakes with fondant as it’ll give you the basics. I highly recommend the Planet Cake book http://www.amazon.co.uk/Planet-Cake-Paris-Cutler/dp/1741963184. I decided to make my own 12 mini Christmas cakes so I’ve been following all your follow up posts! It’s been a labour of love for the last few weeks, feeding them regularly, marzipan will be done this week and I’ll ice them next weekend. I think I’m going for royal icing with sugar craft decorations, but have no idea what quantity of royal icing I’ll need – how much did you need for one mini cake? Help much appreciated! Hi, glad you’ve enjoyed this series of posts. Sorry for missing out the royal icing quantities, I’ve now amended the post. 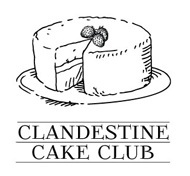 use 100g royal icing sugar and 15ml water for each cake. I recommend you make it in a bowl bigger than you think you need because it goes everywhere! Let us know how you get on. Oh, they’re all gorgeous – you’re so creative and talented! My mum often makes baked bean tin sized cakes, and tends to do marzipan and then a rough snow icing, but no more. They’re all very impressive. 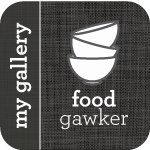 What a wonderful and inspired blog – full of great ideas and great photos too. 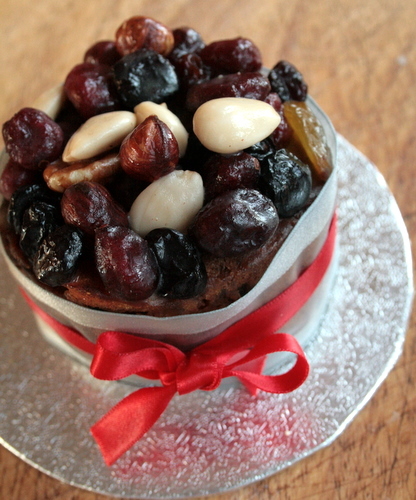 I love the idea of the baked bean tin Christmas cakes. It’s mid-January and I’m about to make some birthday cakes for family members who can never eat too much “Christmas” cake. I shall go and buy tins of baked beans and spagetti hoops right now. Thank you!